I think i'll do some report in the Bug sections of the forum..
Well, i don't think this behaviour is intended, as setting radius 0 should collapse the area with the result of not doing any "hitradius" instance, not compressing it to the impact point: this would force to define an halved damage on each projectile with radius 0. Also, RPG is one of the original hardcoded projectiles, and the custom projectile system, which is what is under discussion, has always been different. But, if they want to do it this way now, at least we will have a consistent behavior going forward. When people play older mods using a new EDuke32 build they will take double damage from a lot of projectiles, though. When people play older mods using a new EDuke32 build they will take double damage from a lot of projectiles, though. I think you should remove stamina or make it optional. Maybe it's not that bad when you just playing the game, but it ruins the gameplay when you think about making a video playthrough. - I don't know why is still not clear, but stamina in KA is not a random choice but a key feature involving combat, movement, some items and future features, so it will NOT be removed, like it or hate it XD; there are so many other mods with standard or faster speed/gameplay, while KA got its own. Stamina will not be removed then, but i can insert an option for disabling stamina bar on HUD, or i can change totally how it's shown. Put on to-do list. Stamina bar doesn't bothering me at all. I'll check out the newest version and maybe make some suggestions after that. I asked to update the first page on the thread with current version and changelog, so you can download it from there; i also encluded Moddb embedded buttons. The next update is going to be the 1.1, most probably on october rather than september, where many fixes and variations will see the light since the 1.0, but also it will feature new content, with a minimum of 3 new weapons and some usermaps. At this point i need to ask you more support, so i can do a good work with this mod. The most important thing i'd ask is the revision of Eduke32 wiki pages, because i need to update the code with new functions and syntaxes (many KA code lines are very old), i cannot disable screen size keys, just for example. The major code issue i recognize is the using of movesprite for gore physic, resulting in some clipping/disappearing issues (due to CLIPMASKs, i suppose). 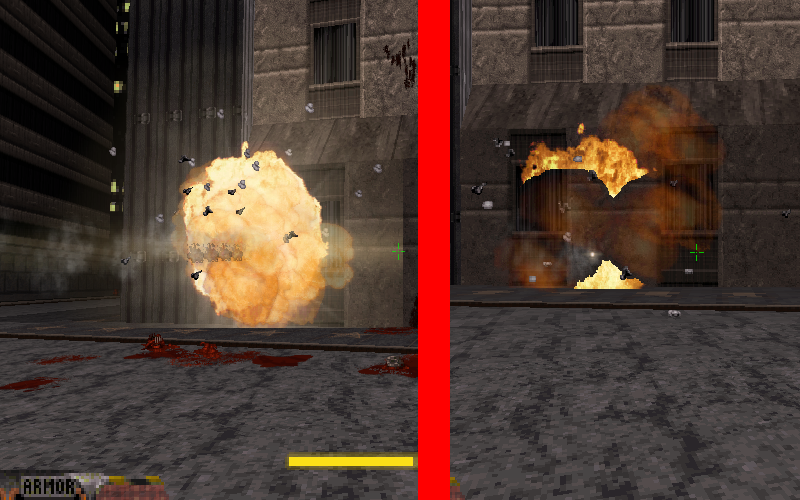 There are still clipping issues on some projectiles, too, after an infinite debug i tried to do. Also there is a transparency issues for hi-res sprites that broke my effects visuals, coming from a 2016 Eduke build, i reported it in bug sections. You are asked to add more suggestions and bug-reporting in the meantime, i think i did a good sum but maybe i forgot something (also read the changelog for the fix i already did). Check kicks. I think Duke can't kick while he is stopping from movement. I mean, Duke continues to move due to inertia for some time after you stop pressing movement keys and he can't kick while that. He can't kick while he moves due to inertia. So i realized that i removed control movement while kicking at very last of the 1.0 release for some debug reason, my fault. Well, your suggestion sounds a bit unnecessary to me but i'll consider it; moreover, this gave me the idea to make that kicking while moving (not running) will result in a small auto-dash. Nice job! My videocard complained a lot with the first release, now it is almost silent. I did the fix on the spider bomb pickup text and on remote command for tripbomb; in reality it is the original pipebomb trigger, fired with fire key, but i added also remote-reload key as well. Will this get a campaign designed with it in mind? KickAss Duke comes from an old project of mine named Duke Nukem Again, a campaign made of X levels and featuring all the content i'm putting (and i will put) in KA. My idea is to add levels in different updates, starting from a collection of usermaps , then adding some KA-exclusive maps and DNAgain campaign at last; you are expected to see a strong presence of alien elements in such campaign, which will be most likely made of a single episode of 8-10 levels. The main issue at maps being done in KA is that i'm not a mapper, so i'm forced to ask help to other people; same thing is true for many sprites i'll need. I take this occasion to ask this kind of help from now. I'm not dead, nor KADuke is dead for now. You see i'm not really into news, update medias and publicizing. I said before i'd release the 1.1 version on October, but i had serious problem in family in the last months. Unfortunately, my father passed away this november. So, now many things will change for sure. Anyway i'm quite fine right now, and i recently resumed my work on KADuke: i did a re-think on how all the content i have in mind will be split in the future updates, then i completed all the features and fixes i mentioned before ( moving only a little of them in future updates ). The major things in terms of content you'll see in 1.1 are five new weapons ( 3 human and 2 alien ) and a major rework on HUD, with the re-introduction of classic and Eduke-alternative style (emulated, with the new KA features) and various tweaks on KA HUD, and a usermap selection (included in a new "episode" named "KickAss Tour"). I bet that the 1.1 release will be out this December anyway, so stay tuned ! The Kickass Tour is a very good idea. It's important to give players a guided, structured experience. When I tried playing KAD before, I felt like I was supposed to make my own fun with it. Most players will quickly lose interest if they aren't given something to do. I recall that you had enough new weapons for at least two games, maybe three. Some of them were very, very good. However, some were not as good and some lacked a clear gameplay niche. So, think about editing down your weapons to the best weapon set possible. Or, if you want to keep all of them, think about how you can incorporate all of them into your game without it being overwhelming or redundant. Beware of making changes that nerf the player or reduce quality of life. A classic example would be adding a stamina meter for running or making the player hold down a key to run. Things like that can be fine if you are offering a new game that is not obviously not Duke 3D, but otherwise people tend to reject such changes. I have to say, the full weapon set is the most personal mean of expression in this mod, and i think only a few weapons are redundant, as they differ in type of energy and damage effects for example. Also they explore concepts that i never saw until now in Duke. Moreover, this is the first Duke Nukem mod featuring tons of weapons that can be all used within the same character, then is not like AMC TC or AA; i remember mods like AeoD and Russian Overkill for Doom, for example. I admit i thought about a pickup/drop system with X slots (like DNF) to give players more control and a personal selection, rather than having all weapon at the same moment... but it is hard to manage, expecially for my ammo/magazine system. This idea is reserved for future updates, if it becomes necessary and viable. Now about gameplay differencies, KA comes from DNAgain, which i planned as a semi-TC with this difference in mind; right now, stamina system and environmental damage (with hazard suit) survived. Again, this is the first non-TC Duke mod that attempts these changes. I know stamina is the most "controversial" feature, but i want players keep it for now, while i do various tweaks to it for making it more comfortable (for example, i doubled stamina regeneration and buffed Colas in 1.1). The ultimate test for keeping or discarding the stamina system will be one of my updates, most probably the next, where i'll improve melee fighting introducing new combos and some close-range weapon. Don't misunderstand me, you have done some excellent work and many of your weapons and effects are awesome. But from your response it sounds like your main goals are to make something you believe has never been done, or prove that you can do it, or express your creativity. There is nothing wrong with any of that, but those goals can get in the way of making the best experience for players. If something is worth sharing on a public forum, then it's worth thinking about the best way to present it so that players are more likely to respond positively. No problem Dan, these are just my ideas, with veiled excuses to the Dukers about how i work on this mod, the idea behind it and how i propose/impose features to the players. What you say is correct, and i take almost all feedbacks in consideration, indeed.